slushed through mud on the mountain bike, then navigated sand traps on the cross’ bike, and now she’s finally settled back into where it all began for her, the road. 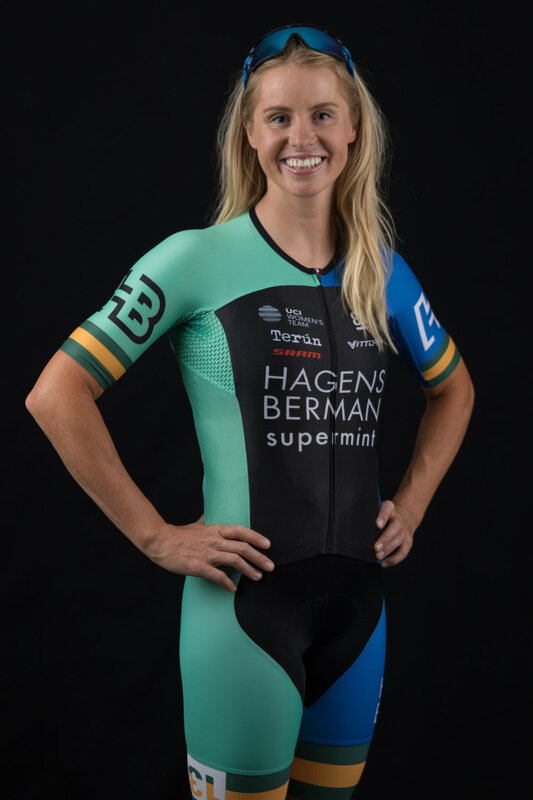 Through the years she’s claimed ten National Titles, won over 200 races, and represented her country at multiple World Championships but she races towards her 30s, she feels like she still has plenty of memories to create. Cycling Disciplines: Road, MTB, CX and anything else on two wheels. Specialty: Depends when you ask the question, but for this year – road. Best Moment in Your Cycling Career: Winning the Australian Road Race Championships in 2015. Any Race Day Habits: Most of my pre-race routines occur the night before the race; fake tan and ice-cream! Favorite Race: I have a lot of favorite MTB races, but my favorite road race in the US last year was the Winston Salem Cycling Classic. Goals for 2018: Commonwealth Games in my home country of Australia, a good performance at Winston Salem, and to tick off a few new races on the program such as North Star and BC Superweek. Favorite Non-Cycling Activity: People watching and the beach, often combined. Biggest Fear: It used to be not living up to my full potential, but now I have no fears, just FOMO (fear of missing out).